In other languages: 한국어, Español. 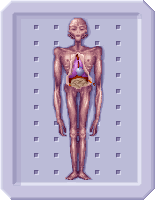 The Ethereal race is arguably the most dangerous species that X-COM forces faced during the First Alien War. As the masterminds controlling the Muton race, and apparently the leaders of the entire alien invasion, Ethereals are rarely seen on Earth. 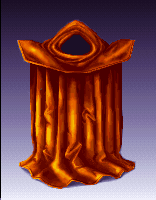 They will not ordinarily be encountered before July 1999, and will only deign to appear personally for the most important missions - building bases, spreading fear, diplomatic negotiations and attacks on X-Com. The Ethereals' terror unit is the robotic, nigh-indestructible Sectopod. Every member of the Ethereal race possesses very powerful psionic abilities that can be used to make X-COM forces panic. It is even possible for Ethereals to take control of X-COM units and use them against us. Only the most psionically resistant troops should be used against Ethereals. The psionic prowess of Ethereals also grants them the ability to fly. This protects them from Grenades, and provides some protection from the Blaster Launcher. Note also that while Ethereals have only moderate Health, they are exceedingly-well armoured. Plasma weapons are strongly recommended for skirmishes with Ethereals, as weaker weapons will struggle to harm them. This being has awesome mental powers which allow for telepathic communication and telekinetic abilities. The apparently weak physical abilities of this creature are sustained by its mental powers. We do not understand how these telekinetic powers work, since they seem to defy the laws of physics as we know them. They are extremely dangerous in any combat situation, where they rely on their mental powers for combat. They rarely appear on Earth since they seem to rely on other races to pursue their objectives. This being is physically retarded and seems incapable of sustaining any life functions. The muscles are severely atrophied and the internal organs appear to be under-developed. The sensory organs, including the eyes, do not appear to function at all. The brain, however, is well developed and draws on a high proportion of the body's blood supply. It is a mystery as to how this creature can sustain itself without external support. The Ethereal takes 0.7x damage from fire, and 0.8x stun damage. There are no Ethereal Navigators, Engineers, or Medics. Ethereal Leaders will be used in their place. Scheduled Retaliation missions always have a possibility of being Ethereal, regardless of the month. This can produce "early" Ethereals if The Martian Solution is researched in May or earlier. This page was last edited on 20 July 2018, at 16:58.